Balloon modeling is a fun activity for a kids party. You can make balloon animals, pirate swords, balloon flowers and lots more. Have you thought about balloon modeling for a fun birthday party activity? It's actually quite easy provided you do a little preparation beforehand. In this article I'll share my tips for making sure everything goes smoothly. I just made balloon models as decorations, party entertainment and a party favor for my son's animal-themed birthday party. I was surprised how easy it was and how much the kids enjoyed it. Balloon modeling will now be a regular feature of our kids birthday parties and other children's events. Can I Make Balloon Animals? You might be wondering, can I make balloon animals or other balloon models? I was hosting a party at home for my son and he didn't like the idea of an entertainer but I needed something to amuse the children other than party games. So, I thought I'd try balloon modeling. You can just start by trying to follow a simple balloon modeling video and picking it up as you go along. Or you could watch some instructional videos like the ones below to give you a basic grounding in balloon twisting first. Buy the balloons early and practice. This isn't something to start the night before the party! Don't be afraid to be quite rough with the balloons, you'll soon get a feel for what you can do with them before they burst. Make enough balloon models for most of the children in advance and store them out of sight. You can even make all the models in advance if you don't want to do it live! Choose one or two simple models to make in front of the kids. And make sure they are quick to make so you don't spend ages on each one. Definitely get a balloon pump - modeling balloons are hard to blow up. Balloon modelling can make your fingers a bit sore if you're not used to it so don't practice too much. You Will Need a Balloon Pump! Modeling balloons are much harder to inflate than regular balloons. I certainly can't blow them up. I watch the experts blowing up balloons and they make it look easy! Well I didn't think so, I was very glad to have a balloon pump. 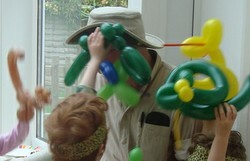 Grandad is a very good sport as the kids have lots of fun with their balloon animals! If your child is having a wild animal or safari-themed birthday party then balloon animals are a fun and inexpensive party activity and party favor. Zoo and jungle theme too. My son had an African Safari birthday party so I put together a collection of wild animal balloon models. The snakes were very popular and easy to make in front of the kids. Balloon Modeling Ideas - Not Animals! Are you planning a birthday party for a child? Here are some tips and advice to make sure the party goes smoothly and the kids all have a great time. A selection of personalized party supplies for girls from infant, toddler and preschooler girls through to older girls. Create a unique party theme for your birthday girl. A selection of the best personalized party supplies for boys. Includes banners with the child's name and even party tableware with the birthday boy's photo on. Have You Tried Balloon Modeling? Thank goodness for Grandfathers! This looks like it really made the party. I'm thinking that this might be fun at our next family reunion. Something to keep the little kids engages. And we'll have lots of doting grandparents to help out.